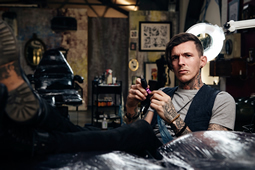 Channel 4 Formats have commissioned Studio Lambert to produce a second series of E4’s hit series, Tattoo Fixers. Tattoo Fixers’ first series attracted an average consolidated audience of 797k viewers and a 4.7% share of audience per episode on E4, rising to 1.6 million viewers an episode when adding the Channel 4 repeat. The E4 premiere episodes have drawn an impressive 11.6% share of 16-34 year old viewers, more than double the channel’s slot average. Speaking on the commission, Head of Formats for Channel 4, Dom Bird said ‘Tattoo Fixers has been a huge success story for E4. What’s more, it’s clear there’s no shortage of terrible tattoos that need fixing out there and we are excited to create more extraordinary transformations to delight our viewers’.